Some currents of avant-garde music in the West during the second half of the last century drew inspiration from the sounds and forms of Indian classical music. As with previous, non-musical Western avant-gardes—one thinks of Cubism’s interest in African sculpture, or the Surrealist fascination with the plastic arts of indigenous Mexico and Oceania—composers and improvisers in Europe and America found stimulation and a certain degree of direction from a tradition at a more-or-less distant remove from their own. And yet through a certain kind of immanence in which elements of the one would be contained within the other, the more successful experiments produced a music of confluence rather than collision. 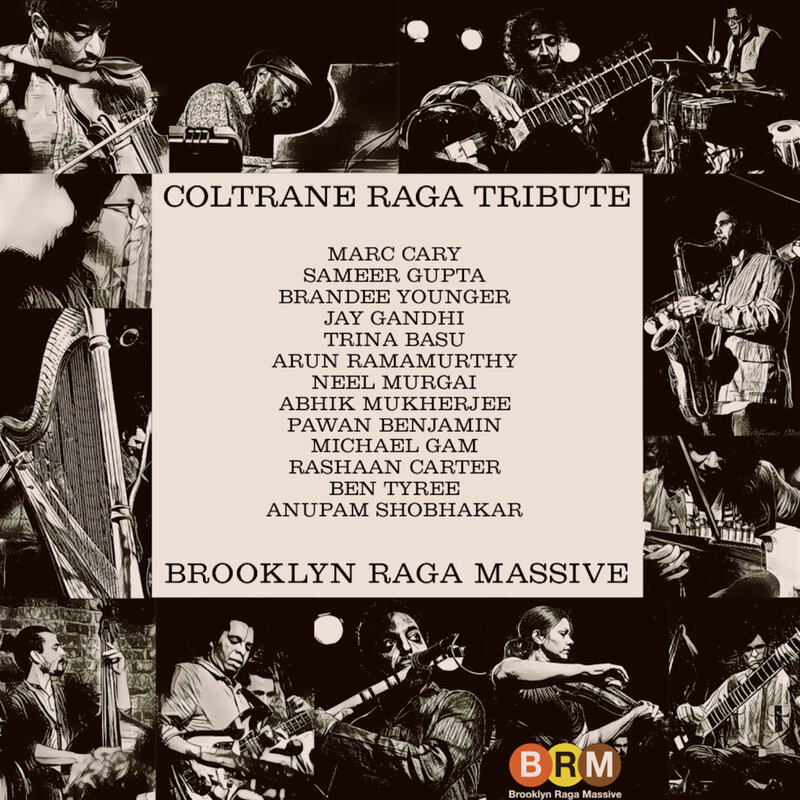 Brooklyn Raga Massive, a large collective of musicians conversant with classical raga as well as with Western music, is a contemporary ensemble continuing the dialogue between Indian and Western music. 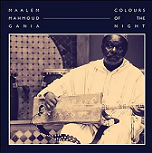 Two recent releases are particularly engaging for the way BRM have taken the raga influences implicit in or hinted at by two figures of the 1960s avant-gardes and made them explicit, integral forces through which their music can be interpreted. Terry Riley’s classic work In C, which debuted in 1964, is a highly flexible piece that has been adapted to many different situations and instrumental combinations of different sizes. It has been realized by ensembles made up of various combinations of Western orchestral instruments; has been played in ensembles for a single type of instrument, including Stefano Scodanibbio’s magnificent arrangement transposed to D for nine double basses; it has been played by guitar ensembles and has even been played by solo trombone with electronics. Further afield of Western instrumentation, the piece has been arranged for a mixture of Western and non-Western instruments, as well as for traditional Chinese and African instruments. BRM’s recording of In C, taken from a January 2017, performance, offers an arrangement of the piece for Western, Indian and Middle Eastern instruments that includes sitar, oud, bansuri, vocals, tabla, hammered dulcimer, violin, cello, double bass, dragon mouth trumpet, guitar, cajon, riq and frame drum. In consultation with the composer, BRM developed an interpretation that preserved the essence of the piece as written while adding elements that draw on the improvisational conventions of raga. As composed, In C integrates improvisation into its very structure. The score is simple—a single sheet containing 53 cells, each of which consists of a brief phrase without markings for dynamics or articulation. Performers are to play the cells in sequence, repeating each one as long as desired before moving on to the next. The quasi-random overlapping of parts gives the piece a shimmering, phasing quality. Although most of the cells are based on a C major triad, others imply E minor, G major or G minor tonalities; these changes of implicit harmony proceed very slowly and—in most performances--on top of a repeated C note, thus making themselves felt more as changes of color within a C major chord rather than as shifts of tonal center. (Although Riley recommends that performers stay within two or three cells of each other, it isn’t unusual for performances to slip; besides adding an extra layer of chance to the realization, this creates interesting and unexpected synchronisms and harmonic ambiguities of its own.) In C’s feel of harmonic stasis aligns well with traditional raga’s limitation to a single harmony, and so hearing the piece played with raga as a point of reference requires little suspension of any disbelief the listener may initially bring to BRM’s performance. Brooklyn Raga Massive go beyond the standard interpretation of In C by adding an introductory alap at the beginning of the piece, and a jhalla to close it. Although the alap is brief—exceedingly so, by ordinary raga standards—it sets the tone for what will follow. What follows is a colorful reading of Riley’s composition enhanced by embellishments of, or solos over, the basic cells. The addition of the solos came at Riley’s suggestion, and who better to make the suggestion than the composer, who himself studied classical Indian vocal music for many years with Pundit Pran Nath? The solos offer a brilliant, and perfectly apt, ornamentation to the melodic fragments contained in the cells. The bansuri solo over cells 12-13 begins a string of solos that include energetic improvisations by oud, violin, sitar and voice; each soloist elaborates and develops the fundamental kernels of the cells in an entirely natural way. The soloists’ incorporation of microtonal embellishments—the notes between the notes characteristic of raga—add an intriguing shade of chromatic nuance to Riley’s basic harmonic structures. Similarly, subsequent solos for percussion bring a welcome rhythmic complexity to the underlying pulse. In fact the percussion instruments—particularly the tablas—play the crucial role of anchoring the piece, usurping the role ordinarily taken by a repeated C played on keyboard. One of the beauties of In C is that there is no canonical version. The score doesn’t specify the size or makeup of the ensemble, leaving the piece open to the most imaginative interpretive possibilities. Brooklyn Raga Massive’s interpretation shows just how rich these possibilities can be. 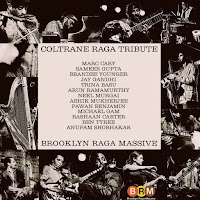 Like their In C, the ensemble’s Coltrane Raga Tribute addresses the work of an artist whose sensibility was profoundly influenced by the modalism and extended improvisations of raga. The release takes eight pieces by John Coltrane and one by Alice Coltrane and orchestrates them for a combination of instruments somewhat different from that used in In C. On BRM’s version of India—certainly a natural choice to interpret—the jazz element predominates, particularly in the rhythm section’s drive and makeup. As with the augmented 1961 John Coltrane Quartet that originally recorded India, the drums and piano are the pivot on which the piece balances, but the alap-like introduction for bansuri and droning bass that takes up nearly a quarter of its length unmistakably demonstrates the correspondences between Coltrane’s composition and the sources that inspired it. Alice Coltrane’s Journey in Satchidananda, the title track from the classic 1971 album, is played close to the original and no wonder: many of the possibilities opened up by a more explicit crossing of jazz and raga were explored in that recording. BRM takes it one step beyond, though, in featuring a rich solo for sitar; the solo for a hard-rock toned electric guitar that follows somehow sounds perfectly fitting. Similarly, BRM ‘s interpretation of Alabama includes a fine sarod solo over tabla and comping by electric guitar. Both In C and the Coltrane Raga Tribute show that the attempts during the 1960s to shape Western music around some of the materials, forms and conventions of raga were more than the passing fads of a decade rich in passing fads; they instead opened a field that continues to reward exploration. Già prima di fondare la sua etichetta discografica (Amirani Records), Gianni Mimmo era musicista e rinnovato pensatore di musica. La sua ascesa come specialista del sax soprano non può non essere accompagnata da una visione globale del jazz e della musica improvvisata. Quando Mimmo pubblica il primo numero di Amirani nel 2005, la situazione del soprano e dell'improvvisazione ha già cambiato pelle e, sebbene l'influenza di Steve Lacy sia enorme quanto un macigno, c'è già lo spazio per ulteriori sviluppi; da una parte c'è la possibilità di espandere il vocabolario delle forme compo-impro, dall'altra non si può fare a meno di attribuire anche al soprano una funzione interdisciplinare, accostandolo all'elettronica, alle arti letterarie e visuali che lavorano sull'accostamento emotivo con il testo e le immagini. Quanto ai rapporti tra improvvisazione e composizione, Mimmo con One way ticket (il primo numero della serie Amirani) scopre un ventaglio di soluzioni che piegano gli insegnamenti di Lacy verso una compresenza di aspetti contemporanei (Webern si unisce a Monk e Mitchell) con un metafisico contorno poetico, che va oltre la sola volontà di dichiarare arte: è un biglietto da visita che non vuole sottolineare un generico riferimento alla poesia (che si compie succintamente all'inizio e alla fine del lavoro tramite la legatoria tra Elliot e Scialoja), ma un vero e proprio umore corporeo della musica che dona suggerimenti per materializzare un suo stato emotivo. Tuttavia, come si diceva prima, Mimmo non fissa certamente lì le sue coordinate, nè comincia a produrre cds in serie tutti uguali come capita spesso nelle discografie degli improvvisatori: lo si vede dalle sue successive registrazioni, che girano attorno ad un nucleo selezionato di attori, dal duo con il trombettista Angelo Contini in Two's days/Tuesday, che cala benissimo il suo stampo nelle pastoie dell'avanguardia, a Kursk (con Contini, Xabier Iriondo, Agua Mimmo e Elda Papa alla fotografia), che proporziona la riflessione sul sottomarino russo alla musica, oppure a Bespoken, atto di nascita dell'interesse del sopranista all'elettronica concreta e rispettosa fornita da Lorenzo Dal Rì; se volessimo usare una definizione calzante, in questa prima fase potremmo dire che Mimmo è abbastanza dipendente dalla multimedialità, poiché lascia che il soprano indaghi in ambiti sperimentali: le relazioni con scrittrici come la Candiani e la Ruchat o le installazioni di Obliquiviali, un set in cui si fondono poesie, immagini, la musica di Bespoken, la fotografia di Papa e l'elaborazione video, dimostra come siano praticabili altre strade feconde per la musica. Il compito di Mimmo è quello di segnalarle, in un momento in cui queste attività restano trascurabili, in quell'ottica di proselitismo musicale indotta dai ragionamenti di Frederic Rzewski, che intravedeva in luoghi particolari della vita pubblica (stazioni, poste, studi privati, etc. in situazioni di attesa degli utenti), la possibilità di far conoscere subdolamente queste dimensioni musicali e abituare i sensi ad una differente percezione. Dopo l'esperienza con Contini, la dimensione improvvisativa riacquista un suo tradizionale connotato nel trio di A watched pot (never boils) con Serrapiglio e Cusa (rispettivamente cello e percussioni) e nel duo di Your very eyes con Iriondo, una perfomance unica per tipologia di strumenti adottata, dato che Iriondo contrasta il soprano di Mimmo con particolari aggeggi a corda, derivati di strumenti tradizionali giapponesi o di propria creazione (il koto taisho e il mahai metak). Sono lavori propedeutici alle due più sapide collaborazioni che il sopranista farà per tutta la sua carriera: la prima è il duo Reciprocal Uncles con il pianista Gianni Lenoci, che sembra voler fornire una versione italiana, aggiornata ed esaltante, del duo Lacy-Waldron, però misurata sull'impronta stilistica dei due musicisti; la seconda è quella sperimentata con Nicola Guazzaloca e Hannah Marshall nei concerti belgi come The Shoreditch Trio ed immortalati in due cds (Again: The Shoreditch trio Live in Bruxelles e The Shoreditch Concert, con l'aggiunta della cantante Leila Adu); il trio mostra una perizia impressionante e costruisce le sue basi in forma di jam improvvisativa itinerante che scatenano mille immagini interiori. Sono questi i lavori che impongono una visione aggiornata dell'improvvisazione italiana, da far ascoltare ai tanti critici e giornalisti esteri che nei loro compendi, articoli o addirittura libri, fanno scomparire la nostra progettualità: qui si riaffaccia in maniera preponderante quella visuale letteraria che abbraccia trasversalmente alcuni rappresentanti dell'improvvisazione italiana e questo succede anche grazie allo splendido transfer musicale decretato da Mimmo, che è in grado di imporre una musica libera, bella e piena di accorgimenti tecnici ben indirizzati. In Belgio, Gianni farà anche una proficua esperienza con i maturi improvvisatori del posto (Van Schouwburg, Demey e Vanderstraeten), un tour di cui resta testimonianza in Sureau per la Setola di Maiale. Allo stesso tempo Mimmo allaccia una relazione con un altro eccellente sopranista svedese, Harri Sjostrom, con il quale condivide concerti (il Live at Bauchhund Berlin 2010) e concetti (che hanno il compito di valorizzare l'infinito patrimonio di Lacy); sono questi i momenti in cui si riconosce in maniera compiuta il lavoro del sopranista, della sua importanza come specialista della materia. Mentre il jazz internazionale santifica sassofonisti soprano come Dave Liebman, Jane Ira Bloom o Chris Potter, esponenti validissimi dello strumento, ma oramai incartati in una formula che non ammette rischi, Mimmo e qualcun'altro nel mondo (Sam Newsome, Michel Doneda, Bhob Rainey) portano fuori dai confini le intuizioni di Evan Parker, Steve Lacy o Lox Coxhill e lo fanno con proprie carature stilistiche. Mimmo, poi, è unico nel suo modo di saldare il jazz e il mondo contemporaneo, per via di una raffinatezza espressiva che è capace di aprirci immediatamente ad una moderna sensibilità uditiva. Dopo i belgi, per Mimmo scocca l'ora della conoscenza degli inglesi, che avviene entrando negli ambienti degli improvvisatori orchestrali, aggregazioni ancora ben nutrite nonostante i tempi, e nelle intenzioni collaborative della violinista Alison Blunt, con cui incide Lasting Ephemerals. Da questo momento in poi, Percorsi Musicali ha avuto l'onore di seguire pedissequamente l'artista e vi ha restituito con recensioni, interviste o concerti, tutto il percorso che il sassofonista ha compiuto fino ad oggi. Perciò qui sotto vi indico i links cronologici dove poter continuare ad approfondire la musica di Mimmo, di cui ho scoperto anche le sue origini pugliesi, quando in un nostro incontro mi disse di aver avuto genitori di S.Marco in Lamis, un caratteristico paesino del Gargano, che si trova a 35 minuti di auto da casa mia. Un'eccellenza scomparsa prematuramente nella musica italiana fu Fausto Romitelli. In Francia, un'equivalente ancor più giovane di Romitelli è stato Christophe Bertrand (1981-2010). Negli anni susseguenti alla sua morte, Bertrand è stato preso in considerazione molto di più di quanto lo si facesse prima, quando egli era in vita, e molti strumenti della contemporaneità ne fanno avvertire gli influssi, dal risalto profuso nell'ambito educativo (lectures ed esplicazioni del pensiero compositivo) fino ad arrivare all'omaggio specifico (riproposizione di sue composizioni in manifestazioni o festivals). Perché? Qual'è stato il punto di forza di un uomo, che già a 23 anni ricevette da Boulez l'incarico di comporre per l'Orchestra dell'Accademia di Lucerna? Bertrand era un prodotto della contemporaneità dell'attuale secolo, ossia quello in cui i compositori avevano avvertito la presenza ingombrante di settant'anni circa di storie di strutturalismo, figurativismo e post-modernità; uno sviluppo che è andato avanti spesso con rigorosità, ma che era necessario per imporre nuove configurazioni espressive direttamente riferibili alla mano di chi le poneva in essere sul pentagramma: è solo lavorando con libertà estrema su tempi, armonie, microintervalli, intensità fisiche dei suoni e tecniche estensive, che si poteva creare un collegamento sottile, ricercato ma direttamente imputabile alla creatività e al pensiero del compositore. Bene, Bertrand fece tesoro di un principio ulteriore, ossia del fatto che qualsiasi tecnica adottata dovesse avere un immediato riscontro nell'emotività dei suoni: dovevasi trattare, però, di una personalizzazione dalle qualità estreme, un modo per specchiarsi dentro e riflettere le immagini (frutto del proprio interiore) attraverso la musica. Evidentemente Bertrand ne aveva molte da esprimere, poiché ciò che si ricava a luci accese dall'attività musicale del francese è infatti uno stile nervoso, una scrittura del tempo in cui gli strumenti producono avvertimenti, contrasto continuo, ma al cospetto di una musica bella, interessante e di contenuto. E' una sorta di effervescenza che viene dalle opere orchestrali di Stravinsky e che ha tanto interesse per gli argomenti di Ligeti, per il suo modo di comporre, per timbri e ritmiche ricercati, con tanta colorazione ottenibile anche dall'esposizione sui microtoni. Ma non ha sicuramente il carattere della loro musica! Prendete un pezzo come Vertigo e cercate di trovare due minuti di pausa completa: non li troverete mai, perché Bertrand è l'espressione dell'inquieto o meglio dell'irrequieto, ma dell'irrequietezza che prende forma in diverse modalità, sotto forma di isola propedeutica di un evento positivo oppure per servirne uno assolutamente rabbioso, così come è nella vita pratica; e se è vero che di pezzi inquieti la storia della musica ne è piena, è anche vero che quella storia non riesce ad affondare nei procedimenti compositivi così come succede nella scrittura di Bertrand. Restando a Vertigo, si fa riferimento a 83 elementi dell'orchestra che dividono quest'ansia con due pianoforti risuonanti e scalari e con una ripartizione dei movimenti che segue la teoria delle proporzioni di Fibonacci (per Christophe uno dei più ricorrenti ausilii per la composizione ma anche uno dei più controversi adattamenti della musica! ); l'orchestra virtuosa deve svolgere un ruolo eccellente nella creazione di timbriche a tema, che urlano la loro indipendenza e quel carattere "criminale" che Bertrand aveva cercato di mutuare dalle lezioni di Lachenmann; con Vertigo, il francese riuscì a valorizzare in maniera differente il clima del film di Hitchcock, creandone uno parametrato al proprio carattere, efficiente trasposizione nella letteratura musicale contemporanea del nuovo secolo. In Scales (un monolitico trattato sull'apprensione della figura della teoria musicale), Bertrand proseguì su un sentiero fatto di dirompente potenza acustica, in una corsa per ricomporre l'equazione tra virtuosismo ed emozioni, mentre in Okhtor (l'anagramma di Rothko), l'ispirazione si consegnava all'idea di poter creare grappoli di accordi sulle sovrapposizioni di colore del dipinto N. 10 Brown, Black, Sienna on Dark Wine del pittore americano; in entrambi i casi le nostre orecchie si stagliano contro un pozzo di riconduzioni tecniche perfettamente finalizzate per produrre un piacere intrinseco in chi l'ascolta, che mettono l'accento anche su differenti possibilità di sfruttare un certo tipo di phasing e sulle propensioni armoniche dei clusters. Della stessa natura è la musica da camera, dai due quartetti per archi (che sembrano simulare un duello di spade) ai due pezzi per pianoforte (in cui Bertrand inoltra nella composizione un controverso ed aggiornato concetto di elevazione spirituale), fino al nerbo scoperto di Treis (per violoncello, violino e piano) e Satka (si aggiungono flauto, clarinetto e percussioni). Il francese è riuscito solo ad incidere un cd monografico per la Motus dal titolo La chute de rouge, un lavoro che risalta il graduale rinforzo e consapevolezza della personalità artistica, ma gran parte della sua musica è comunque reperibile sulla rete youtube ad opera di alcuni benefattori della musica contemporanea. Inoltre, resta indispensabile la visita al suo sito internet, in cui troverete disponibili anche alcuni suoi saggi sui concetti di trasversalità e del linguaggio, che denotano una completa idiosincrasia verso la sintesi multimediale, elettronica e finanche verso un certo tipo di canto lirico. La sua sottovalutazione si spiega solo pensando al fatto che Christophe era davanti ad un'innovazione per processo, che non poteva soddisfare coloro che rigorosamente hanno sempre spinto la composizione a favore di un pieno ed eccessivo utilizzo del termine "novità"; con Bertrand, lo stesso Lachenmann sarebbe parzialmente spiazzato. Scrivere un libro sull'Art Ensemble of Chicago oggi può essere riduttivo se pensiamo a quanto già fatto editorialmente nell'assecondare descrizioni, pareri ed episodi rituali della loro musica e sollecita anche la volontà di rappresentare tutto un quadro di vita, di socialità e preparazione professionale, che forma i contorni indispensabili della comprensione di un fenomeno musicale. Naturalmente, ogni scrittore si focalizza sugli aspetti che più ritiene interessanti per la divulgazione, ma in generale non si può fare a meno di passare dalla lezione della storia. E' proprio la necessità di impostare una history del gruppo di Chicago che ha spinto Paul Steinbeck, professore di teoria musicale alla Washington University di St. Louis, a scrivere la prima dettagliata storia sull'Art Ensemble of Chicago, basandosi su una capillare ricerca effettuata sulle fonti. Message to our folks scava tra sorgenti di notizie vecchie e nuove, per organizzare un volume quanto più completo dell'esperienza dei continuatori della Great Black Music: se è vero che vengono ripresi in replica molti passi di alcuni libri pubblicati in passato, è anche vero che l'autore integra in maniera pressoché perfetta la moltitudine di interviste (cartacee, telefoniche, via email) che hanno attraversato la vita dei componenti, giudicate in funzione utile allo svolgimento di un filo cronologico degli eventi. Perciò, da una parte, chi ha letto il seminale A Power stronger than itself di George Lewis (che però è più centrato sugli aspetti musicali ed estetici), il New Musical Figurations di Ronald M. Radano (una biografia su Braxton), o Point from which creation begins di Benjamin Looker (che si addentra sulla storia parallela del BAG, l'associazione di musicisti di St. Louis), non troverà molta novità; così come in parte non le troverà se ha letto la collezione di interviste che l'Art Ensemble of Chicago fece a Lincoln T. Beauchamp nel suo testo; Message to our folks espande invece il carattere informativo del lato interviste e soprattutto fornisce un elemento nuovo di analisi per un testo del gruppo, ossia introduce l'analisi musicologica delle partiture dei brani di tre albums che si ritengono significativi nella carriera della band (i brani sono quelli di A Jackson in your house, di Live at Mandell Hall e del video concerto di Live from the Jazz Showcase). E' una ricostruzione puntuale ed appassionata quella di Steinbeck, che sottolinea la particolare formula presentata, le origini di un gruppo che ha visto sulla South Side di Chicago compiersi parecchi eventi fondamentali per la nascita e sviluppo delle attività del gruppo, l'esperienza dei due anni parigini, fino ad arrivare al contratto con la Ecm Records e con un certo benessere economico. Steinbeck mette molto in luce il trapasso e la condizione sociale di un gruppo che per meritarsi il rispetto della comunità e dell'audience musicale, ha dovuto tanto spiegare, tanto girare (un carico di persone e di strumenteria musicale), tanto reinvestire i propri profitti per garantirsi una propria autonomia per sé stesso e per la collegata istituzione dell'AACM. E l'aspetto musicologico, che in una storia difficilmente viene portato ad evidenza, ritorna sotto la forma delle partiture accennate, che vengono dettagliate visivamente e per commento scritto, senza che manchino le informazioni sui side projects dei singoli elementi. Perciò è un libro che si lascia leggere con piacere, rimanda all'ascolto di ciò che è scritto e contribuisce a fornire un'ottimo quadro di assieme per delineare le personalità di ogni singolo musicista; ognuno di loro conduce ad una caratteristica non replicabile, dove il free jazz, il gospel, il teatro, la poesia e la musica contemporanea trovano una loro condensazione. Un approfondimento riceve, poi, la discussione sui motivi della loro insistenza in slogan come quello della Great Black Music, così come ampio spazio trova la diatriba tra Lester Bowie e Wynton Marsalis in merito a come doveva essere interpretata la tradizione jazzistica. Cito un calzante passo di Jarman nel testo di Beauchamp, che dà molte spiegazioni sullo "spettro" storico vissuto dal gruppo: "...Malachi always represents the oldest entity because he would always wear these long full flowing robes. And he would look like an African/Egyptian Shaman. His persona would emulate that, and his music and his style. He is very ancient. Then Moye was really in the midst of the African tradition. His drumming, his style, his approach, his feeling and his interests, were not a single African tradition, but a total African tradition....My position was more moving towards the contemporary. I was Eastearn oriented. These three were the pantheistic element of Africa and Asia. Roscoe represented the mainstream sort of Shaman, the Urban Delivery Man, delivering healing qualities...Lester was always the investigator, wearing cook clothes, which is healing, creating energy and food. Then he advanced his awareness and went to the doctor's experimental laboratory. All of this Black imagery going from the "Ancient to the Future" is represented in this stage attire....". Message to our folks è un libro la cui consultazione può essere totale o parziale, perché in grado di soddisfare ampie categorie di lettori: il musicologo, il lettore curioso e a caccia di argomenti da dibattere e coloro che non hanno (o ne hanno poche) di dritte sull'attività e sulla musica di Roscoe e compagni, per elaborarne la potenza e la significatività. Cerca in tutti i modi di evitare di ingenerare l'idea di parlare di un "museo" della musica e ne propone la sua attualità. N.B. Libro in lingua inglese, edito dalla University Press of Chicago. Tra le compositrici non più con noi, una delle più sottovalutate è stata certamente l'americana Maryanne Amacher. Con scarsissima visibilità mediatica, la Amacher ha costruito un portafoglio installazioni di tutto rispetto ed è stata, nel campo dell'elettronica, una fonte di creatività che si è concentrata su uno dei più interessanti fenomeni dell'acustica, ossia le emissioni otoacustiche. Se si introduce uno stimolo uditivo, sotto forma di determinate frequenze, anche ritmicamente cadenzate, l'orecchio interno, attraverso la coclea, restituisce sempre un terzo suono, musicalmente soggettivo, che non esiste fisicamente all'esterno. Con un paio di cds per la Tzadik (che possono essere reperiti e ricostruiti con facilità sulla rete), la Amacher ha aperto un varco in ciò che le emissioni possono costituire; alla Amacher piaceva affermare che è come se l'orecchio "cantasse" e fosse in grado di proporre una polifonia involontaria. Grazie alla microfonazione e alle possibilità introdotte dall'elettronica sintetica, la Amacher percepì la necessità di tirare fuori questi suoni, per usarli a scopo compositivo. Il suo lavoro fu molto apprezzato negli ambienti accademici, un approfondimento della scoperta empirica del violinista Tartini, che finalmente poteva essere trattata secoli dopo in maniera scientifica e soprattutto poteva essere messa a disposizione della composizione. Su quest'ultimo aspetto bisogna dire che purtroppo fu scarso l'interesse (e lo è ancora oggi) e la Amacher non riusciva a spiegarsi il perché. Al pari del fenomeno dell'olofonia, che consisteva in una tecnica di registrazione in studio capace di riprodurre i suoni/rumori esterni come se essi fossero accanto a noi*, le emissioni otoacustiche probabilmente facevano un pò paura all'audience, dal momento che si trattava di assistere ad eventi musicali in cui mettere sotto pressione la mente aurale e la protezione acustica per via dei volumi esaltati. Sebbene la Amacher invitasse gli udenti ad un'altra prospettiva di ascolto, immaginifica e partecipativa, sono stati pochissimi i compositori che hanno sviluppato i suoi concetti, anche dopo la sua morte; il più intrepido e immersivo discepolo è stato senza dubbio il danese Jacob Kirkegaard che nella sua installazione titolata Labyrinthitis, ha cercato di oltrepassare qualche limite, portando su un piano compositivo speciale i principi della Amacher: infilandosi un microfono-sonda nell'orecchio registrava quel "terzo suono" e, attraverso la conduzione esterna delle casse amplificative, lo porgeva all'ascolto dei suoi uditori nelle stesse condizioni. Gli esiti furono, per molti, esaltanti, poiché durante la produzione sonora vennero in aggravio alcuni fenomeni corporei non volontariamente provocati: qualcuno avvertì formicolii variabili su ventre e schiena, addirittura i più anziani con handicap uditivo provarono l'ebbrezza di un mini ritorno all'udito pieno (dato anche il volume sostenuto). La mia riflessione, però, si concentra su questa domanda: se è vero che l'emissione otoacustica può diventare uno strumento compositivo fenomenale, utilizzabile oltre il campo medico, in quali termini si deve parlare della sua estetica musicale? Alcuni "sound characters" della Amacher, sopratutto quelli impostati su frequenze basse o in arpeggi salvifici, nonché la stessa suite di Kirkegaard appena accennata, delineano quel solito criterio di valutazione che deve superare l'ottica di quelli che pensano che questa roba sia solo art performance. La sostanza dei suoni deve comunque indurre a trovare quella bellezza che è criterio generale, e poi specifico, per sostenere la corretta valutazione estetica e se guardiamo bene a cosa sta avvenendo nella ricerca musicale, possiamo accorgerci che esiste una divergenza di obiettivi, che può essere letta in settori musicali affini all'elettronica o anche nel mondo dell'improvvisazione: prendete il lavoro di specifici ricercatori all'Ircam come Alex Chechile, che manipola i segnali otoacustici per una folta schiera di strumenti al fine di creare spazi musicali "superdotati", in una rincorsa verso nuove frontiere della psicoacustica e della biomeccanica dell'ascolto, o il lavoro di intercetta dell'argomento profuso da improvvisatori come Hans Leeuw e Diemo Scharwz (all'interazione di elettronica e digitale) che segue il taglio stilistico di molta produzione di Evan Parker al sassofono, costruita con sortite nel mondo dell'elettroacustica; sono tutti esperimenti che fanno pensare che uno dei traguardi della musica sia proprio la sua materializzazione scientifica e il raggiungimento di una consistente valutazione estetica, che si contrappone alla realtà di giovani compositori come Christopher Haworth o Thomas Ankersmith, che propongono sistemi complessi di sintesi e composizione, che lavorano su alcune frequenze otoacustiche e digitalizzazione, suscitando evidenze musicali soggettive, di difficile interpretazione. Sembra, dunque, che il drone, lo spazio o una riorganizzazione di elementi calibrata sul progetto espressivo, sia più in grado di suscitare sentimenti rispetto ad una asettica scoperta di reazioni della mente: droni, spazialità e tessiture lavorano però in modo diverso rispetto al caso classico. Pensate ai tanti droni dell'ambient music che, tramite la ripetizione o il sostenuto uso delle note, provocano dopo alcuni minuti la "fusione" mentale, ossia lo scollamento dell'attenzione da ciò che si sta ascoltando; qui, invece, si vuole provocare il contrario, una presenza attiva dell'ascolto e soprattutto regolata dalle leggi invisibili degli organi umani (in questo caso l'orecchio). *l'esempio lampante ci viene fornito nel rock dei Pink Floyd, come applicazione delle teorie di Hugo Zuccarelli, in varie porzioni di The Final Cut, dove elicotteri ed esplosivi sorprendono auralmente l'ascoltatore. Ivo Perelman tra live e nuove collaborazioni: l'ultima sestina per Leo R.
Ivo Perelman non cambia scenario per le sue registrazioni, abituandoci, da un pò di tempo a questa parte, ad un uso quasi megalomane della pubblicazione di musica, con 5, 6 ed oltre cds, variamente configurati in tema. Appena pubblicati per Leo R. (una destinazione discografica che non ammette ritorno per il sassofonista brasiliano), c'è una nuova sestina di lavoro assieme a Matthew Shipp (ormai il suo pianista di riferimento), che stavolta lo ritraggono in alcune esibizioni dal vivo e in una serie titolata nel campo delle figure geometriche. Vorrei precisare che aldilà degli esperti che seguono capillarmente il lavoro di Perelman da molto tempo negli Stati Uniti (Neil Tesser è uno di quelli), in Europa e soprattutto in Italia l'unico che mi ha preceduto nella conoscenza profonda dell'artista è stato un isolato Vittorio Lo Conte, come confermato da Perelman nelle nostre missive. Posso ben dire che è stato grazie a me e a Percorsi Musicali, che è stata ridata la giusta luce all'artista, a cui ho dedicato un dettaglio unico della sua lunghissima discografia, molto prima della rivalutazione "indotta" che alcune riviste blasonate di jazz gli hanno dedicato solo recentemente. Di questo penso che Ivo me ne sia grato, lui che ha anche vissuto per un periodo di tempo a Roma. Ora, di seguito, dò un commento cd per cd, partendo dai live. Live in Brussels documenta una delle esibizioni fatte nel tour in Europa: è quanto di più completo e riassuntivo si possa ascoltare per comprendere la musica dei due musicisti: formato doppio, in questi cds Shipp suona senza centro di convergenza, con le scale simula un saliscendi concreto e vi porta in posti oscuri, qualche volta magari in odore di minaccia o avvertimento; dal canto suo Perelman è in perfetta catalessi lirica, soffiato e vibrato portato a massimo esponente, è il prototipo ideale dell'avventura sonora. In part 2 c'è molta complicità nei temi, una narrazione quasi aggressiva, dove a quasi metà del brano, Perelman caccia degli acuti incredibili, il suo tipico ed unico urlo straziato che viene mirabilmente accompagnato dai clusters di Shipp; è una resa drammatica che non deve però far pensare ad uno scenario di disfatta, ma più ad un caos e ad una concezione espressionistica. Non ho ancora avuto la fortuna di incontrali, ma Shipp e Perelman parlano già meravigliosamente coi loro strumenti. L'attenuazione delle tinte avviene nel finale, dove la tensione viene convogliata in un pattern di sonorità speciali, dove Shipp va veloce su una scala impostata al seriale e Perelman frammenta. Nel secondo disco il set non si discosta dall'offrire plurimi paesaggi musicali che sfondano alcune porte del passato, sono esercizi neurali poderosamente guidati da Shipp, che a circa metà del percorso, lascia Perelman solo come un jazzista al club, ad impegnarsi con un sax quasi idiomatico, che porta fuori la sua personalità, svisando sulle ottave. Naturalmente, fortunati gli avventori di quella serata. Il Live in Baltimore è invece un concerto che Shipp e Perelman hanno eseguito con il batterista Jeff Cosgrove. Il tenore generale dell'esibizione mostra un incontro ispirato, con tanti dettagli, completamente atonale ma con Cosgrove che fa un figurone, perché solo un batterista con certe capacità può essere in grado di tessere una tela ritmica (seppur senza nessuna necessità di collisione con gli altri due musicisti) adeguata a questo turbine di espressione che si presenta. Un concerto per pochi, 75 poltrone rosse e 75 ascoltatori trascinati dalla musica in sensazioni che fuoriescono dalla razionalità del collocare armonie, melodie o dinamiche ritmiche. Si ritorna in studio. Subentrano le figure geometriche. Di solito esse sono emblemi di costruzioni che nell'arte hanno avuto anche significati misteriosi, mutuati dalla scienza e dalla matematica. Ma non è questo il caso, sebbene il quartetto che affida la sezione ritmica a William Parker e Bobby Kapp, abbia un alone di mistero. Heptagon mantiene le caratteristiche delle espansioni creative di Perelman e Shipp, subordinandole però ad una struttura più tendente all'interplay di matrice jazzistica. Contesto più equilibrato ma non meno interessante. E' il Perelman più old-style che qui si trova, un termine che naviga leggermente dalle parti dell'eufemismo del termine, poiché le pennellate free e la dilaniante potenza sonora di Perelman sono elementi che proprio non mancano; Heptagon è amabilissimo nei suoi svolgimenti, con una perfomance dove Kapp dimostra di avere ancora uno smalto ed un feeling non sedati con l'età e Parker imbusta a meraviglia l'ambientazione musicale di fondo. Scalene è l'associazione geometrica triangolare che Perelman utilizza per il trio con Shipp e il batterista Joe Hertenstein, il terzo batterista della serie dopo Cosgrove e Kapp. Hertenstein si dimostra più istintivo e l'impressione è che non sia integrato di fronte a due treni di creatività così speciali come Shipp e Perelman; la verità è che il batterista tedesco segue rotte complesse, in ossequio alla versatilità roboante che da qualche tempo i percussionisti dell'improvvisazione stanno ritornando ad offrire nei segmenti aggregativi; sentendo part 5 o part 7 non si può fare a meno di pensare ad un drummer che punta su intelaiature potenti, che rivelano un background che può tenere assieme anche la ritmica rock e non solo free jazz. Perelman ha voluto sperimentare questo tipo di soluzione per la sua musica, ed ognuno può valutare ciascuno per proprio conto se questo è un bene nel contesto complessivo della sua espressione. Octagon è il quartetto, senza Shipp, ma con il contrabbassista Brandon Lopez, Gerald Cleaver alla batteria (quarto batterista) e per la prima volta il grande Nate Wooley alla tromba. Octagon si presenta più introspettivo, muscoloso, deve superare ostacoli, ed in tal senso è proficuo e valido il lavoro fatto da Lopez e Cleaver, che presenta una ritmica più creativa e frammentata; Wooley entra in Part 2 con note sostenute e gracchianti, frutto di estensioni, mentre Perelman entra quasi in un gioco simulatorio con il trombettista. L'incontro con questi musicisti è certamente una nuova esplorazione di intenti per Perelman. Di fronte ad un professionista eccelso dell'improvvisazione atmosferica che oggi rappresenta una delle più sincere e valide evoluzioni del genere, Perelman cerca di adeguarsi, di spogliare la fitta ed usuale interposizione del suo sax a favore di un raccordo con una struttura labirintica. E per fare ciò deve sciogliere il lirismo o la verve espressionista a favore di una più consistente lavorazione sulle tecniche estensive, come succede nella girandola di soluzioni di part 4 o 5, che impongono di tirare gli strumenti fino a perder fiato. Improvvisazione con tanto di marchio dei musicisti e strappi di gran livello, che vengono perseguiti anche in Philosopher's stone, trio con Shipp e Nate Wooley, dove il trombettista si inserisce a perfezione nel contesto consolidato del duo piano-sax. Qui è Shipp che fa propulsione, quel lavoro che in Octagon era riservato alla ritmica, aprendo ed aggiornando il climax dell'improvvisazione. La mia opinione è che però sia sempre Perelman a distribuire le idee, ad adeguarsi e a provocare il tenore di certe improvvisazioni, che in alcuni casi restano splendide, così come succede nella sezione centrale di Part 6, che sembra soccorrere narrazioni oscure, con Perelman e Wooley che si rincorrono sui sovracuti tanto da renderli sonoramente irriconoscibili per il loro strumento. Tipico delle comunità musicali dell'Oriente europeo ma con una fortissima prevalenza degli studi in Ungheria, il cimbalom è uno strumento che ha avuto un profondo riassetto nell'ambito della composizione contemporanea: il grande cambiamento che sta tra Kodaly e Kurtag (prendo come esempio questi due riferimenti lontani ma importanti) risiede nei poteri conferitigli; sebbene sia sempre stato un fenomeno di dimensioni limitate nell'universo compositivo, si può certamente affermare che i compositori hanno superato nel tempo le barriere imposte da una visione compositiva in cui lo strumento rappresentava un essenziale rimando di una cultura popolare adeguatamente resa colta, per giungere ad una prospettiva in cui l'attaccamento alla scoperta e all'organizzazione di nuove polarità di suoni, è diventata la regola. Nel lontano 1961, Kurtag lo mise in evidenza di fronte ad un violino (Eight Duos for piano, op. 4) e nel 1973 attuò un ripensamento completo sullo strumento in Splinters op. 6c, accorgendosi che la mancanza di intonazione si sposava tremendamente bene con linee melodiche di parvenza seriale o lasciando andare le risonanze; in Ungheria, per il cimbalom nacque una scrittura parallela, dove Kurtag fu in ottima compagnia (i compositori Làszlò Sàry, Istvàn Làng, Sàndor Szokolay, l'esecutrice Màrta Fàbiàn, etc.) nella ricerca di confronti, dialoghi o abbinamenti timbrici, talvolta creandosi i presupposti per una condensazione implicita e psicologica della musica popolare in un nuovo involucro, del tutto contemporaneo. Con Repons di Boulez (1984), poi, si aprì una nuova strada per il cimbalom, soprattutto dal punto di vista tecnologico, strada che però non sembra essere stata molto battuta dai compositori delle generazioni successive, che hanno spesso scelto di restare in strutture classiche; al contrario un compositore come Kurtag, che per il cimbalom ha continuato a scrivere in maniera estensiva inserendo persino un frammento per cimbalom nei gioielli del Jatetok, ha riscosso l'ammirazione di molti compositori e musicisti specifici dello strumento, e questo consenso è stato profuso soprattutto dagli italiani, impegnati in questi ultimi quindici anni nell'ampliamento ed arricchimento del repertorio, quasi sempre avvalendosi della competenza specifica di Luigi Gaggero, titolare a Strasburgo dell'unica classe per lo strumento in Europa. 2) Luca Francesconi: l'Etude for cimbalom del 2005 è praticamente una pallina a velocità variabile, che gira sul telaio del cimbalom e che inquadra anche elementi persiani. Sia Solbiati che Francesconi hanno scritto anche concerti per cimbalom: Gaggero ha eseguito di Solbiati la sua Nora (composta nel 2008) e il Kubrick's bone di Francesconi (composto nel 2005), per i quali non vi sono ancora registrazioni ufficiali. others) inoltre vanno considerate le inserzioni di Luca Mosca nelle sue opere da camere intestate a Kafka, La dona danada di Claudio Ambrosini, per soprano, ensemble e cimbalom esteso, Chop Suey di Mauro Lanza e Estribot di Carla Magnan, tutte composizioni di cui non esistono registrazioni o ascolti in rete e di cui, purtroppo, non so documentarvi più di tanto.